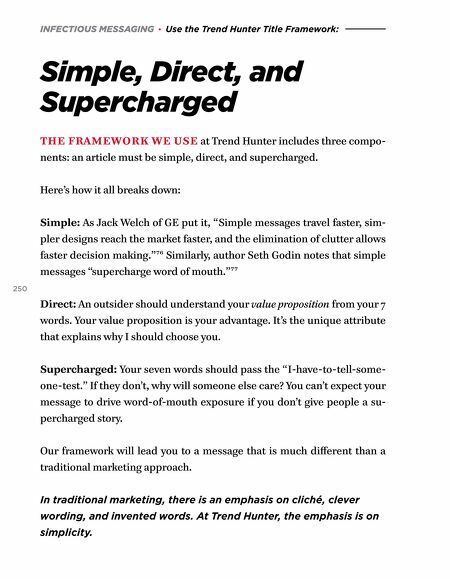 INFECTIOUS MESSAGING · Use the Trend Hunter Title Framework: Simple, Direct, and Supercharged THE FRAMEWORK WE USE at Trend Hunter includes three compo- nents: an article must be simple, direct, and supercharged. Here's how it all breaks down: Simple: As Jack Welch of GE put it, "Simple messages travel faster, sim- pler designs reach the market faster, and the elimination of clutter allows faster decision making. "76 Similarly, author Seth Godin notes that simple messages "supercharge word of mouth. "77 250 Direct: An outsider should understand your value proposition from your 7 words. Your value proposition is your advantage. It's the unique attribute that explains why I should choose you. Supercharged: Your seven words should pass the "I-have-to-tell-some- one-test." If they don't, why will someone else care? You can't expect your message to drive word-of-mouth exposure if you don't give people a su- percharged story. Our framework will lead you to a message that is much different than a traditional marketing approach. In traditional marketing, there is an emphasis on cliché, clever wording, and invented words. At Trend Hunter, the emphasis is on simplicity.